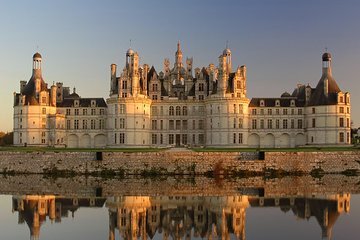 Vea y pruebe la majestuosidad de este recorrido de 11 horas desde París que le lleva al Château de Chambord y las bodegas del Valle del Loira. En Chambord, aprenderá todo lo que hay que saber sobre el castillo del Renacimiento francés durante una excursión con audio. A continuación, pase un rato en dos bodegas familiares y saboree vinos blancos, tintos, rosados, espumosos y dulces. Con el apetito abierto, acomódese en una de estas bodegas para disfrutar de una comida gourmet tradicional. estas bodegas para disfrutar de una tradicional comida gourmet. Esta excursión para grupos pequeños, limitada a ocho personas, incluye la recogida y vuelta al hotel en el centro de París en monovolumen con aire acondicionado. Levántese temprano para su recogida en el hotel en monovolumen con aire acondicionado y viaje con su guía durante unas dos horas al sur de París hacia el castillo de Chambord. En la ruta, escuche hablar sobre la región vinícola del Valle del Loira mientras degusta cruasanes y pasteles de hojaldre. Llegue a Chambord, construido por el rey Francisco I de Francia, y admire su opulencia en su interior, aprendiendo sobre su historia a través de un audioguía. De regreso a bordo de su vehículo, pasará a través de los viñedos de Montlouis-sur-Loire, Vouvray y Touraine. Admire los coloridos paisajes compuestos por uvas cabernet franc, chenin blanc y sauvignon blanc. En la finca de vinos Vouvray, conozca al enólogo y disfrute de una comida gourmet tradicional, acompañada de una cata de vinos. Después del almuerzo, visitará otra bodega familiar donde podrá degustar auténticos vinos del Valle del Loira que no están disponibles en el resto del mundo. Dependiendo de la disponibilidad, deguste vinos blancos secos y dulces, tintos y rosados, así como vinos blancos espumosos. Su excursión de 11 horas termina con el transporte de regreso a París, donde lo dejarán en el centro de la ciudad. Loved this trip and it was one of the highlights of my vacation. Its a full day out of the city with a small group of fellow travelers. We were the first pick up in the morning so we also had the pleasure of driving through different neighbors in Paris while we picked up other guests. Victor was a wonderful guide. Very knowledgeable about the city, French wines and history. Chambord was beautiful. We arrived early and there were only a few other visitors. The self guided tour was easy to use and interesting. After the Château we drove to a small organic family run vineyard. We toured the cellars and then sat down to a country style lunch prepared by our host. The wood stove was going and the wine was flowing. Perfect. Our next stop was the Marc Bredif winery in Vouvray. Another great tour and lots of wine to sample. Beautiful scenery along the way. We were a relaxed and happy group on the ride back to Paris. Victor also sent us a list of restaurants to try to Paris which was a nice bonus. We absolutely loved this tour! We started the day with Victor picking us up at our hotel. He provided delicious butter croissants for breakfast and a bottle of water be sure to grab your own coffee from the hotel or something if you need caffeine in the morning. Victor drove us to Chateau de Chambord a gorgeous castle about 60-90 minutes outside of Paris. You get almost two hours to just explore on your own, but all admission and stuff is included in your overall tour package. After the castle, we drove to Vouvray in the Loire Valley. We went to this great little winery that is entirely organic and family run. The owner walked us around the property and explained their history and how they plant, treat, pick, make and store their wine. It was very informative and interesting! You do a small tasting of three different wines and then the owner takes the opened bottles to their back yard where they provide a three-course lunch. It was awesome to just sit and talk while enjoying great food and excellent wine. After that was done we went to one other winery and did a tasting. They explained their process they are a larger winery and we got to see their storage caves and how the caves were made. The tour is a full day commitment, but it is definitely worth it! Victor was an awesome guide and Juliette at le Clos de la Meslerie was a very gracious host! Victor was an amazing guide. It was just the two of us in my party that were part of the tour and it was fantastic. Every part of the trip was amazing, from the castle, to the gourmet lunch, to the winery. Very enjoyable and would recommend to anyone.